This week, as the team and I met together to hear each other, I really sensed that God was actively involved (as He always is) in our lives. I went into the sharing time a bit anxious, with notes to make sure I did not forget something, but once I got started I hardly looked at the notes and was able to just share from my heart in a sense of trust and peace. As a part of my quiet time, one of the things I read almost daily is a truth I came to one time with a counselor as I was dealing with a conflict. It is: "When I enter into conflict with a pure heart and trust and not as a power struggle to win, it leads to peace and us affirming each other." I sense God has enabled this "peace and affirming each other" to happen here with the team. The team has very generously given hours in reading and meeting to work not only on the issue of my desire to do peacemaking presentations about CPT with the Mennonite Brethren, but also to working through the misunderstandings and human errors that developed, all with lots of care and consideration for me. And through this sharing I have come to see that my hearing problems and level of Spanish could lead to misunderstandings that could very easily endanger the team or one the organizations with whom we work. One incident that really brought this home to me was at church on Sunday. I gave an "Amen!" to a brother sharing his belief that the recent killing of the FARC leader by the military was part of God's plan to end the war! Of course, I deeply do not believe is that any killing is in God's plans. I misunderstood him. Thankfully, another CPTer was along to help me see my mistake. At the same time the team strongly affirmed my sharing on a one to one with taxi drivers and street vendors etc, particularly using the Peace Pilgrim booklet. This is a gift I feel I have and am being used by God in doing. It is real good to have this gift recognized and affirmed by the team, as it was something that I was doing but I wasn't clear till now that the whole team affirmed this. I sense your prayers and concern have had a definite part in bringing a space of peace and trust so we could hear and share with each other very openly. Through it all, I do feel we came to a good reconciliation between us and unity in agreement on what is the best solution. The newspapers and people we talk to all indicate that things are tense in the government here with the situation with Ecuador and Venezuela. Pray that through this crisis leaders might come to see the futility of using the military to try to solve the conflict and that there be a peaceful solution. Thanks to each of YOU very much!!! 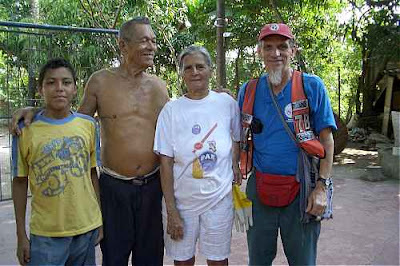 Here I am on the right on a visit with Chan, a 80 some year old natural healer. Chan is the one without a shirt. He teased me when I took the picture saying, " Don't you like my shirt?!!" A few years ago when my leg was swollen from a peto (a giant mosquito) bite, his remedy healed me when antibiotics didn't work. On the left is Chan's grandson, to whom Chan is teaching his healing art. In between us is his wife. Ask me sometime and I'll tell you other ways he helped me.